Imagine 300 people together, climbing on each other, making a tower which could get 10 stages high, with a lot of people in the base, and just one -a young child- at the top, with one of its arms up, hand pointing to sky. That’s a “Castell”, human constructions that have been done in Catalonia for more tan 200 years. 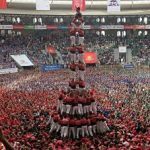 Human castles started as the evolution of an ancient valencian dance called “Muixeranga”, which used to finish with a small pilar done by 2 or 3 men. Over time dance was lost, but music stayed to indicate the construction’s evolution of the castle. 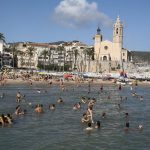 The first known document to talk about a “castell” is from 1712 at the town of Valls, Tarragona. 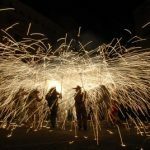 During the following 100 years, the construction spread across the catalan territory, turning into a tradition and usually related to the patron saint festivals of each town. Finally in November 2010, with a consolidated annual “castellers” -the name of the people in the castle- championship that takes place during the warm months from April to November, the construction of “castells” was declared element of Intangible Cultural Heritage of Humanity by UNESCO. A castell has three different parts: “Pinya”, “Tronc”, and “Pom de Dalt”. La pinya is the base, a bunch of big and strong castellers who will support the whole weight of the castle, and will cushion the blow in case of an eventual failure. Depending on the type of castle, the base can also have “Folre”, “Manilles” or “Puntals”, castellers in special places to give more stability or power to that base. The central part of the castle is the “Tronc”, the trunk. They create floor upon floor with between 2 and 5 castellers, depending on the number of stages the construction will achieve. The “Pom de Dalt” is the uppermost levels of the castle. Young childs who will raise up the “Anxaneta”, the tiniest one, who will show its hand up. The Castell is now loaded. Once the tower construction has been successful, there’s a new upcoming and even more difficult job. It has to be as well unloaded without falling down. During the championship this will give extra points. During the whole construction you will hear different kind of sounds provided by the “gralles i timbals”, sorts of flutes and drums. Every single song indicates the evolution of the castle in its construction, so everyone knows what part is being raised. This is called el “Toc de Castell”. In Valls, the cradle of Castells, is taking place the project “Món Casteller”, the museum of Castells, who will open soon to show the world history, evolution and future chances of this great tradition. During the last years, and thanks to catalan emigration worldwide, small castellers groups are being created in cities such as London, Paris, New York or even Beijing. They’re small “colles”, which of course cannot do big towers. But that’s not the important. 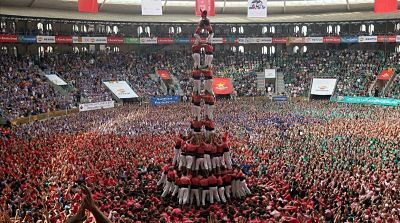 Castells are a proof of strength, constancy, confidence, and the best example of teamwork you will ever find. It is a really incredible show, worth doing an excursion to any town where it’s done that day. Don’t miss it, you would regret.